If you didn't already know, there are two types of brakes commonly found on a forklift. 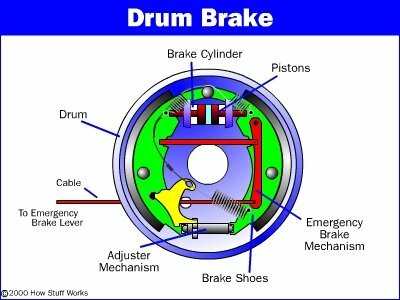 The first type of brake system you might find is the traditional Drum Brake system, so called because the braking part is drum-shaped. Inside the drum, two large, curved brake pads push outwards, slowing you down. At the top of the picture to the left is a 'slave cylinder' which pushes the two brake pads outwards when you press the brake pedal. The pads rub against the inside of the drum, and the friction slows you down. Drum brakes are good because they're simple and reliable. The second type of brake system you will find on a forklift are Wet Disc Brakes. 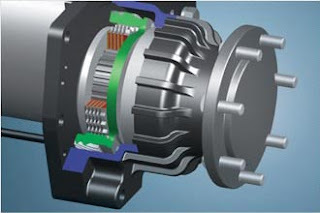 Seen here in the photo to the right, the wet type disk brake, mounted on the output shaft of the drive motor, delivers smooth and reliable operation in continuous use. Ideal for heavy-duty applications, Wet Disc Brakes virtually eliminate traditional drum brake maintenance and can help you save thousands of parts and service dollars over the life of your forklift. In heavy duty operations, brake maintenance can significantly contribute to higher operating costs. Traditional drum brakes require service usually every 1500 hours of use. With Wet Disc Brakes, traditional brake jobs can be eliminated saving money on parts and service and increasing uptime. Most manufacturers install these cost savings brakes on their larger forklifts, usually over 10,000 lbs as standard equimpment. They offer them as optional equipment on trucks 4,000 to 10,000 lbs. On Hyundai Forklifts, you will find these costs saving brakes on any forklift 4,000 lbs or larger as standard equipment. So not only will you get a quality forklift for a below market price, but you will bet Wet Disc Brakes that will save you money on parts and maintenance cost while increasing truck uptime.